Cricket offers some of the most diverse, unique and wide-ranging betting markets of any sport. At no time is this more evident than during the Ashes, when bookmakers go above and beyond to accommodate the demands of punters all over the world. This in-depth guide covers all the match bets, futures, exotics and Ashes cricket specials you might encounter whenever Australia and England renew hostiles in the Test arena. Ashes cricket betting is one of those landmark events that draws massive interest from the global gambling community many, many months before the first ball is bowled. That is where futures markets come into play, giving punters the opportunity to take early odds on outcomes that may not be determined until the end of the series. These offer great reward in exchange for a little extra risk, especially if you get your bets on prior to the start of the series. Series result: Pick the eventual outcome of the series – Australia win, England win, or draw. That’s all there is to it. To regain/retain the Ashes: Will the reigning Ashes champions reinforce their supremacy with another series win, or will the challengers succeed in wresting the urn away from their arch-rivals? This is much the same as series betting, except the draw is taken out of play. Draw no bet: Instead of living and dying by the end result of the series, this option gives you a bail-out if it ends all square. The odds on either team winning are shorter, but you get your money back if the series is drawn. Double chance: This one gives you two bites of the cherry. There are three options: Australia win or England win, Australia win or draw, and England win or draw. As with the draw no bet market, the double chance offers shorter odds with greater likelihood of success. Correct series score: Some of the most popular Ashes outright markets, correct score bets are also among the toughest to pick – especially before the series has started. To win, you need to tip the exact number of matches won by each team throughout the series (e.g. Australia 3-1 England). Player props: Bookies do a roaring trade on player performance markets every time the Ashes come to town. Popular options include player of the series, top series runscorer, top series wicket-taker, batsman/bowler doubles and team specials. Exotic futures: Betting operators love to get adventurous for major events like the Ashes. Will any player score a double century? Will someone take 10 wickets in a match? Will there be a tie? There are plenty more markets of that ilk available in the lead-up to the first Test. 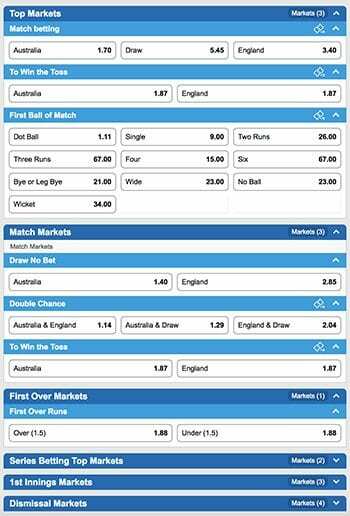 Punters can choose from an enormous array of markets for each and every Test of the Ashes series. These can range from the straightforward to the downright obscure, incorporating everything from overall results to play-by-play propositions. Win draw win: Does exactly what it says on the tin. Pick either Australia to win, England to win, or the match to end in a draw. Double chance and draw no bet: These work exactly the same as the outright equivalents detailed above, except that bets are settled upon the outcome of the match rather than the series as a whole. First innings markets: Some of the most popular cricket betting markets compare each team’s performance in the first innings of a Test. Which side will lead at the halfway mark? Who will put together the highest opening partnership? Which team will score the most runs in the first over? Exotic bets: Concerns over integrity have led to a diminishing of the cricket exotics available on matchday, but punters can still indulge in specialty markets such as the method of the first dismissal, what will happen on the first ball of the match, and so on. Few cricket betting markets offer better value for money than the player specials available throughout the Ashes series. Is your favourite batsman about to explode into form? Is there a bowler paying overs at a ground where he always takes big wickets? Scouring the stats and studying the form can pay huge dividends here. Top runscorer: Pick the batsman who will make the highest individual score. This bet is typically offered in two varieties: top team runscorer for the first innings (e.g. David Warner to top score for Australia) and top match batsman (e.g. Joe Root to make the highest score for either side, in either innings). Top team wicket-taker: Pick which bowler will finish with the most wickets. Again, this can be restricted to each team’s first innings (e.g. Mitchell Starc to take the most wickets in England’s opening dig), or it can cover the entire match. Man of the match: Which player will win the official MOTM award? Batsmen tend to dominate these markets, which means there is often value to be had in tipping an in-form bowler or an allrounder who contributes with bat and ball. Over/under lines: Bookies also take bets on whether or not a batsman will surpass a certain par score in the first innings. For example, let’s say Steve Smith is given a 33.5 line; you can bet that either he will score 33 runs or less (under), or that he will score 34 runs or more (over). Head-to-head matchups: Cricket fans love comparing one star to another, which is why bookmakers have several markets that pit rival batsmen against one another. All you have to do is back the player who you think will score more runs. These can also feature two bats from the same team (e.g. David Warner versus Steve Smith). You will find all the markets listed above – along with plenty more quirky exotics and Ashes specials – at our top-ranked online bookmakers. Each of these sites ticks all the boxes for price points, market range and customer service. To ensure top value on every bet you make throughout the upcoming Ashes series, we recommend signing up at all of these bookies and comparing the odds before you put your money down.